I usually wear glasses but when I wear contacts I wear colored ones. I think they are super fun to wear. Well I have beady little almost black eyes so its fun for me lol. I wore my green ones yesterday. I also own blue ones. 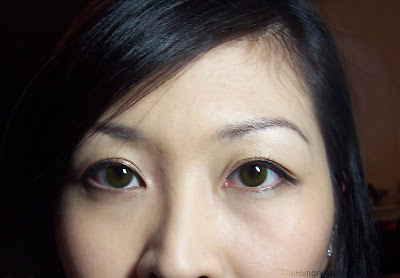 Someday I want to try some circle lenses, they look so cute! Oh yeah, it's hard to put them in and take out because of my long square nails, I stabbed my eyeball yesterday! I used to have some blue colored contacts a long time ago. Love the polish you got, it looks really pretty! That polish is very pretty! For contacts, I try to take contacts out with the sides of my index finger and thumb so that I don't poke my eye out! This is a really nice colour on you! The contacts look great as well-my eyes are beady and almost black too (lol!) so it's fun to change it up once in a while! Oooh, that green is so darned cool! It's mesmerizing. Your eyes are pretty! That polish is too - it kind of reminds me of the one light purple I have, OPI Done Out In Deco. You don't have beady eyes :P Circle lenses are cute, but I heard that they hurt? noooo kae!!!! your eyes are gorgeous! :) they look so natural on you! Very beautiful Orly. And thanks for showing us your colored contacts. I can see how it would be hard to do quite a few things with nails like yours. How do you tie your shoes? Probably just get used to most of those things with your nails. You looked gorgeous with your green contacts. You don't have beady eyes! Be careful and try that side of the fingers method. Love that color of polish on you. Pretty! I am pretty new to wearing contacts as well and it took me A LONG TIME to get used to taking the lense off of my eye w/o pinching my eyeball. Glad I've gotten used to it. Btw, nice shade (as always). Thanks, yeah I had to invent a new method for my long nails lol. Thanks, I like them because they look natural, the blue ones is very obvious fake looking. hmm I dont have that shade, can never get enough purples tho! thanks! it's kind of addicting. Oh well I am wearing a ton of makeup, no joke. oh man i should get those pics from mum with all our eyes and make 1 big picture, just to see them. I'll have to check out THE TOOF BLOG later today! Thank you, well sometimes i can't pick small stuff up like my bobby pins and it's aggravating. but most part you really get used to it! thank you, yeah i might wear mine more than twice a month if i ever cut my nails! I love pastel purple! And you look so cute!